What’s the worst part about buying a new TV? Innovation had made TV’s thinner and thinner, much thinner than a wooden pencil, and let’s just give the manufacturers a round of applause. "Speakers, in this innovation have suffered a lot and in the wake of just sticking a speakers in such thin TVs, manufacturers just put in a garbage of a speakers." …in order to save you from the ordeal of tolerating your poor TV speakers. This list contains best TV speakers under $100 that don’t ask for much space or complexity, and will sit under your TV using a simple wall mount or keeping it on your desk. Hence without wasting much time let’s jump right into the list. In couple of years, Amazon’s own home-grown brand AmazonBasics has built an household name for itself for reliable and affordable consumer electronics products that offer an excellent price to performance ratio. 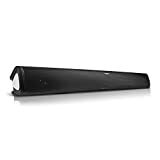 Keeping that in mind, the AmazonBasics 2.0 Soundbar too is an excellent speaker system that offers a brilliant sound quality though at a very inexpensive price range. This budget soundbar from AmazonBasics is sleek and slender in size and can easily match to a TV that is 32-inches and big. 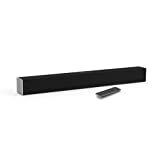 The AmazonBasics 2.0 Soundbar has a length of 31-inches and offers a 2.0 speaker system that consists of 2 satellite speakers embedded inside this long soundbar. Moreover you also get Bluetooth connectivity as well that makes it easy not only to connect this soundbar to your TV but also to other wireless devices like smartphones, tablets and laptops as well. Also available are three sound modes: Standard, News and Movies that offers variety of sound equalization depending on the kind of program you’re watching. The Standard mode is great for watching TV shows, News offers increase in treble so that you can hear dialogues more clearly, and the Movie mode boosts bass and mids so as hear movie’s soundtrack and audio clearly. To keep things simple, you get a small size remote as well that hosts various buttons like play/pause, forward and backward, volume up and down, Bluetooth, connectivity changes, power, mute and so on. Moreover inside the box you also get Optical Cable, RCA cable, Power Adapter, Stereo Cable and wall bracket mounts. Due to absense of a sub-woofer, your audio won’t feel thumpier compared to soundbars under $200 and under $300 that come with an external sub-woofer, however if your main aim is to get a decent sound upgrade over your recessed TV speakers, then the AmazonBasics 2.0 soundbar is an excellent choice as well. It offers a sound output of 25W, which is loud enough to make the sound audible sitting at a long distance. There are always new companies making the round that introduce excellent products at low prices and always give consumers a bang for their buck. One such company is Bohm that has introduced multiple audio equipment in Headphones and Speakers segment, and one of their prized product is Bohm’s BA66 soundbar. If you look at various products from Bohm, the one thing that has been consistent about them is great looking products. I’ve gone through various products from Bohm, and not once have found an audio equipment that looks dull or poor in design, and the same philosophy is carried out with Bohm BA66 soundbar. It is one of the loudest and best soundbar for small room in our list and contains a total of 6 drivers in it’s long body of 32 inches. The far left and far right side of this best low cost Bluetooth speaker contains 1.5-inch driver each, while the centre hosts 4x 2.5-inch loud drivers that work together to produce a total sound output of 60W. As I mentioned earlier, this good and cheap soundbar from Bohm comes with Bluetooth connectivity, whereas it also has support for stereo, RCA and optical inputs. The package in which the Bohm BA66 comes includes: the soundbar itself, along with 3.5mm cables, optical cable, remote, wall mounts and user manual as well. Moreover to make listening fun, this best inexpensive soundbar for TV includes three audio modes: Music mode, Movie mode and Night mode. The first two modes adjusts the equalizer in order to accentuate audio while listening music and movie respectively, while the Night mode helps when the little ones are asleep. Coming to its sound quality, as it’s featured in my list of best soundbar under $100, it doesn’t dissapoints at all. For small rooms, this is an excellent companion that offer a room filling sound, along with plenty of bass and an overall balanced sound, just don’t keep the volume at full because the sound will start to distort. Volume anywhere between 30-70% is a sweet spot. If you’re looking for the best soundbar for PC under $100, then surely the Razer Leviathan Mini should be your #1 choice. We have featured the Razer Laviathan that comes with a subwoofer in our list of best soundbar under $200. Coming to the Leviathan Mini, with a length of 8-inch, it makes up to be a great choice if you need a soundbar to keep in front of your monitor or next to your laptop. Since it’s a battery powered soundbar, you need not connect it to an external power source, however with a battery life of just 10 hours, you might need to charge it every alternate days. It’s a complete wireless soundbar that offers Bluetooth connectivity with Aptx technology for a skip free sound listening. You can connect this soundbar to your TV or computer via the provided 3.5mm jack that saves the hassles of connecting multiple wires between the TV and speaker. Technically it’s a Wireless Bluetooth speaker, but for sure is an innovative audio equipment that offers a strong bass and great treble, moreover you can also carry this soundbar along with you while stepping out of the house as well. Since it’s only 8-inch long, it also won’t take much space in front of your TV or desktop monitor as well. With addition of NFC pairing, it’s probably one of the most advanced soundbar in our list under $100. Design wise, the Razer Leviathan Mini looks very modern and keeps up the overall look of the brand’s other products meant specifically for gamers. The top of the speakers houses three buttons: Volume Up, Volume Down and a round button that can be used to sync another Leviathan Mini for a complete stereo sound. However for the uninitated, this soundbar is a proper 2.1 speaker under $100 because it contains a two 45mm drivers at the front and a passive radiator at the back that offers a loud and balanced sound. Pyle has been a pioneer when it comes to manufacturing soundbars and other Home Audio Systems, and the Pyle PSBV600BT is no less than a brilliant product from the company. Unlike the other soundbars in our list, the Pyle PSBV600BT can actually be called as sound base, a technology first brought forward by ZVOX. A sound base, as the name suggests is typically a soundbar but can be used to keep the TV on it. 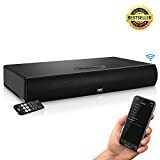 BLUETOOTH: The soundbar speaker features built-in Bluetooth allows you to wirelessly stream audio from your favorite Bluetooth devices (works with virtually all Bluetooth-enabled devices like iPhone, Android, Smartphone, iPad, Tablet, PC, etc. ALL-IN-ONE COMPACT SYSTEM: The TV audio system features exceptional sound reproduction technologies that effectively recreate the entire audio spectrum. UPGRADED SPEAKERS: The soundbar speaker features include bottom-mounted subwoofer with ported tube design that allows for extended bass performance and 4 full-range speakers that bring you crisp, full-bodied sound. CONNECT TO EXTERNAL DEVICES: TV Bluetooth speakers allow you to connect to additional external devices like your TV, laptop, computer or home theater thanks to the AUX (3.5mm), digital optical and RCA Stereo input connector jacks. FULL SYSTEM: The soundbar stand system includes full function remote control, so you can control your Bluetooth device, change inputs and adjust volume from anywhere in the room. Hence in any case; you can’t mount your TV to the wall, the Pyle PSBV600BT can serve both as a soundbar and a base to your TV as well. You might ask, what’s the advantage of such an audio system? Well first of all; such a system provides a proper base to your TV and due to extra room space, the speakers inside can produce deep bass and powerful sound. Moreover this soundbase can handle TV’s with size ranging from 32-50 inches and can handle weight close to 110 lbs, which is very good for its size and price. Specifications wise, the Pyle PSBV600BT is 21-inch wide with a depth of 12-inch and height of 3-inch. Inside it hosts a 2.1 channel speaker system that consists of 2 speakers at the front and a fairly large 3.5-inch downfiring subwoofer as well. This speaker combination is capable of producing sound output of 30W, and is loud enough to fill a small living room. Connectivity wise, you get the fairly common 3.5mm AUX input, RCA and Digital Optical connection, moreover it also has Bluetooth for wireless connectivity. Installing the Pyle soundbar too is very straightforward, you have to just place it on a table top, connect it to a power source and to your TV via digital cable and off you. Since it has a fairly large cabin, you get the right amount of bass and a strong and stable sound quality that accentuates dialogues and spoken words without overpowering bass. If you need a really long soundbar that offers loud sound (upto 30W) and support for HDMI-ARC along with a black-on-black-on-black color scheme? Richsound Research TB220L is the soundbar meant specifically for you. Just like the other soundbars mentioned in our list of best budget soundbar, the TB220L too comes with a 2.0 speaker configuration that offers Bluetooth connectivity and is easily wall mountable. Design wise, the Richsound Research soundbar looks a lot pricier than it really it and also feels that it comes from a premium audio brand at a premium price as well. The front of the soundbar has a long continuous metal grille that covers the entire front and the brand’s logo in the centre, the plastic built top is completely clean with no button at all. You might wonder, where are the buttons placed? They’re placed on the right side of the speakers and only has Power On/Off and Volume Up and Down button. Moreover the entire back is clean as well, with connectivity ports shifted entirely to the right side of the soundbar that includes optical and auxillary inputs along with HDMI-ARC. Most people have complained about the poor signal between the remote and this soundbar, however the main reason is, the soundbar sits so low on a table top that it’s hard to catch the signal from a low angle. Hence I’d recommend to keep the soundbar close to the edge of the table it’s placed on or operate the remote in angle that is in line or a little higher than the soundbar. …but honestly I’m a big fan of Vizio soundbars and one of its speaker had to be in this list as it’s one of the best affordable soundbar under $100. No doubt you get an excellent sound quality soundbar if it comes from Vizio, but you also happen to get a good looking and non-obstrusive designed TV speaker system as well. It’s minimal design is what I love and can easily blend-in with the design of your TV and room interior as well. This 29-inches long soundbar can easily go well with TV’s that is 32-inch and long, however it will be best suited for a 42 inch tv as this long soundbar won’t overshadow the size of your TV. The Vizio SB2920-C6 comes with a (as expected) 2.0 speaker configuration that is loud enough to offer a 95dB sound output and doesn’t feel tinny or recessed like other soundbars; you might consider in this sound range. You can also setup this Vizio’s cheap soundbar with a subwoofer; incase you feel you need extra bass once you get this soundbar. To make the deal sweeter, Vizio offers Bluetooth connectivity too allowing it to be connected to your smartphone and tablet on the go. What’s more is the included accessories in the package, you get: remote control, RCA-to-3.5mm cable, RCA cable, TOSLink cable, 2x Wall Mount Brackets, 2x Wall Mount Screws, Wall Mount Template, Power Adapter and 1-Year Warranty Card along with User Manual. I’m surprised to know that this best TV speaker under $100 has a built-in amp that accentuates audio signals coming from TV, making you hear loud and clear sound at any given time. Along with remote control, you get few controls buttons on top of this soundbar like: Power On/Off, Audio Source, Bluetooth, Volume Up and Volume Down. There’s also very small 12 mini LEDs towards the left side of the soundbar that notify about the speaker’s volume, which in my opinion is an astute advantage over other soundbars. If you need a very long soundbar at a very affordable price with a design that will match up to your newly bought TV, then I’d suggest you to go with the Taotronics TT-SK15 Soundbar. It’s one of the longest soundbar in our list of Best Soundbar under $100, with a length of 34-inch and can easily be mounted under TV’s as big as 42 to 50-inch. What makes the Taotronics Soundbar design standout is the metallic silver colored touch board in the center of the speaker. It contains touch buttons at top for Power On/Off, Volume Up, Volume Down and switching between input source. It’s front shows the kind of input connection is active by lighting up the LED above its name. To keep things simple, you also get a wireless remote that houses usual set of buttons along with mute button as well. Unlike other soundbars that offer only 2.0 channel connectivity, the Taotronics soundbar has 4 drivers that produce 10W drivers each that produces a total sound out of 40W and two passive radiators at the back that helps in offering a deep and powerful sound without distortion. Connectivity wise, this best budget soundbar under $100 has a 3.5mm audio jack that oddly located at the right side of the soundbar. Whereas on the back you get connectivity options like: RCA input, Coaxial Digital and Optical input as well. As with all soundbar in this list, the Taotronics TT-SK15 too comes with Bluetooth connectivity with a range of 10 meters and is useful while playing music wirelessly from your smartphone, tablet or laptop.